This one's for all the guys who love Christmas. We know you're out there because you're the one's who help us put up and run all those wonderful over the top out side Christmas light displays. 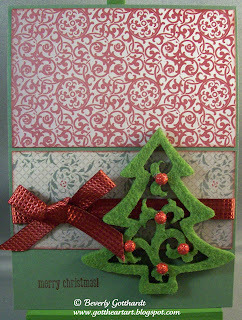 Supplies: 4" X 5 1/2" Always Artichoke card blank, Papers: Stampin Up-Designer Series Paper Deck the Halls, Stamps: Merry Crittermas, Ink: Stampin Up-Cherry Cobbler, Hobby Lobby- Make It Christmas Felt Trees, Mark Richards-red glitter sticker dots, Stampin Up-Cherry Cobbler Quilted Satin ribbon, Tombow glue. 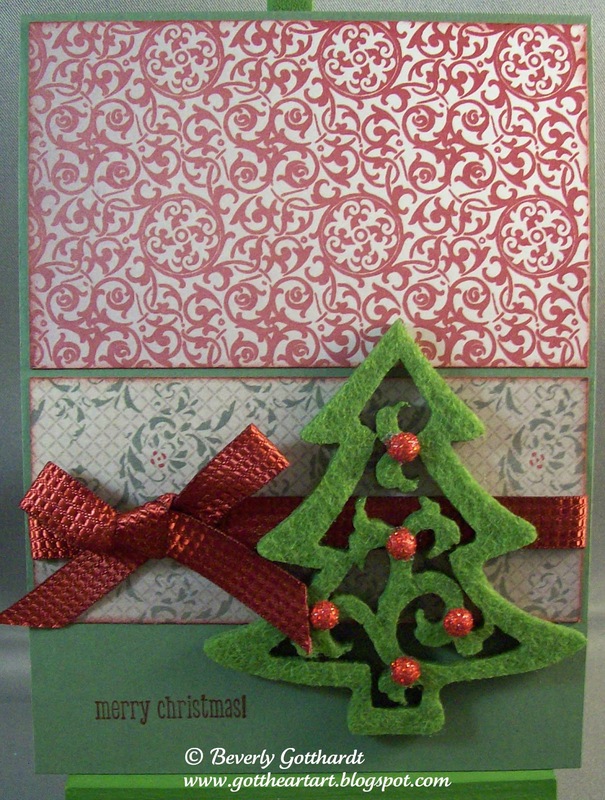 Love the soft texture of that sweet little holiday tree ... so glad you joined us at jingle belles. the tree with the baubles is just gorgeous - what a lovely card! Lovely papers and layout. Thank you for sharing with us at Bah! Humbug! yeah fab card Bev - love it. Lovely colours and I really like that felt tree.